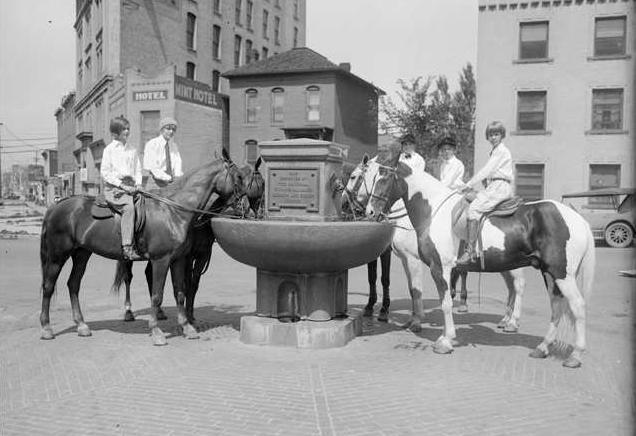 Between 1906 and 1912, the National Humane Alliance presented somewhere around 125 Horse Watering Troughs to cities and towns across the country, including Denver. Herman Lee Ensign, who died in 1899, dedicated his fortune to funding the National Humane Alliance in order to "spread about humanitarian ideas among the people." Such education, Ensign hoped, would instill in people "especially the young, ideas of humanity both to the lower animals and to each other." The fountains were produced in Vinalhaven, Maine, an island off the coast from Rockland. One of the fountains was relocated to a park in Derby, Connecticut; their community has a web page that offers great information and photographs of the fountains from across the country. The Denver fountain is located in a small, paved triangle in the Civic Center District, where Colfax Avenue, Tremont Street, and 13th intersect. Although the fountain was refurbished in 2010, unfortunately, the fountain no longer works.